SIZZLE: Lake City .50 cal. BMG 660 Grain FMJ M33 Ammo. Current production, American made. This potent stuff from Lake City is ready to rock! 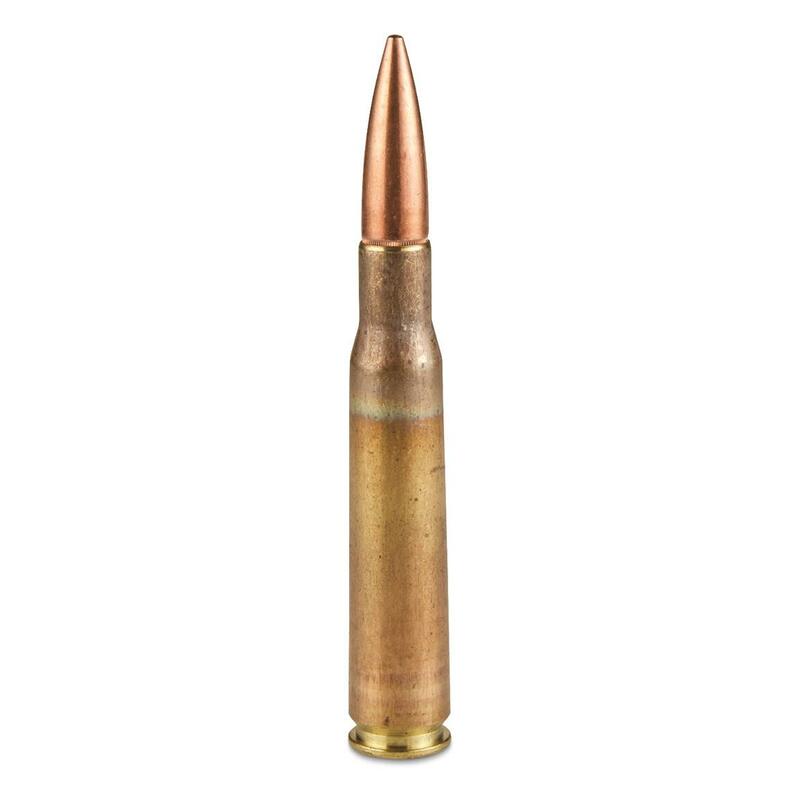 660 Grain, full metal jacket boattail (M33) bullet. Brass-cased, Boxer-primed, reloadable, non-corrosive. Muzzle Velocity: 2,910 F.P.S. Muzzle Energy: 12,413 ft.-lbs. Powerful rounds... "pull the trigger" now! Please Note: Ammo Can is NOT included. 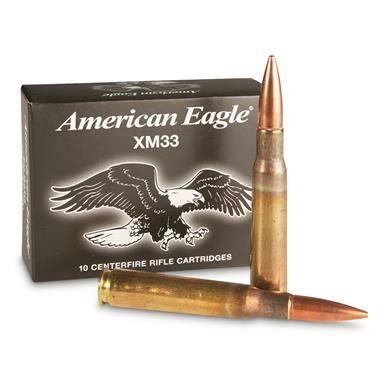 American Eagle, .50 cal., FMJ, 660 Grain, 10 Rounds is rated 4.7 out of 5 by 14. Rated 4 out of 5 by PapaJon from Needs more recoil This is great ammo, but it’s too easy to shoot. It clearly needs a heavier bullet and more powder. I can still hear out of my left ear. Rated 5 out of 5 by Gung Ho from Great price. Excellent ammo. High quality well made ammo. Usual Federal quality. Never had any problems with this ammo. Rated 5 out of 5 by Aaron0313 from Deal! Ammo casings had a bit of corrosion on them most likely due to storage, not a problem. They shoot fine and it is hard to beat this price! Rated 5 out of 5 by Abbigail from Satisfied We have yet to set a round off, but so far. My boyfriend is more than happy and super stoked to blast some rounds off soon! Rated 3 out of 5 by Gramps96Kz from Do not buy because of the online picture! Good price on the product.....when shipment arrived I opened the boxTo my surprise the ammo was packed in 10 (10 round) plain cardboard boxes (Not a big deal) The Big deal was the 50cal ammo can.....the can looked like it was just shipped in from Viet Nam (1967) and it MOST certainly was waterproof! When I finally beat it open(lid) with a dead blow rubber mallet....it had water inside......so I dumped it out(side) The can has now dried out now but I am not storing anything in this can.....the ammo looks pretty good (Some corrosion on the brass was expected)I have not had an opportunity test fire any rounds yet......So I consider it a pretty good deal for the ammo ....just plan on a different 50cal can for storage! Rated 5 out of 5 by GENE from Excellent product. Good cheep target round. Show those pests who's boss! Big performance without the big price tag.